September's Thursday Night Swiss has concluded. In all we had a total, over the four weeks of battle, of 20 participants. And, as the scoretable will show, the games this month were hard-fought. 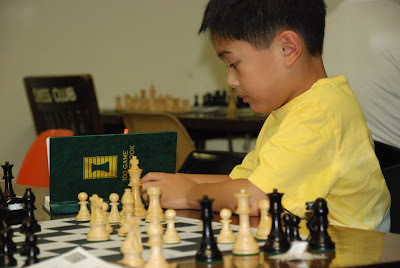 This was Timothy's first tournament, and we hope to see a good bit more of him. Timothy is a product of the increasingly sucessful South Station Simuls. Timothy came to the Simul two months ago, learned about the Boylston, and the Thursday Night Swiss was his first rated touranment. Welcome Timothy! •Oliver Traldi with 3 points! Oliver is making some rapid improvements in his play and this is reflected by his rating. Coming into the Thursday Night Swiss a month ago his published rating was 1640. Today is rating is 1864! Congratulations, Oliver! Now its time to play with the big boys! Turning our attention to the overall winners, there was a fight for 2nd Place as well with two making it to that honor. Congratulations to two of our long-time stalwarts! Congratulations to everyone. It was a great, hard-fought tournament. Remember that victory is never a static condition. You can continually try for it, and you have to continually defend the victories you garner in the chess world. The next chance you have is the October Thursday Night Swiss starting 4 October. This coming Saturday, the Boylston will be taking a short break from G/60 play to hold the inaugural edition of Rapid Robin Octads, an exciting new tournament featuring seven rounds of Round-Robin G/30. That's right. Seven. Unlike with our popular Quads tournaments, however, withdrawals in Rapid Robin Octads will be allowed. Side games should be available to those whose regularly scheduled opponents have withdrawn, and they will count towards the main tournament score, allowing for plenty of bonus points. To clarify some recent confusion, THERE WILL NOT BE A TORNADO THIS SATURDAY. Fans of the Tornado will be happy to know, however, that we will be holding a Tornado on October 20th. There will not be, as we had listed, a $5 open on that day, as we feel that would give too few opportunities to use the accumulated free entries. Thank you. It's National Book Week on Facebook. The rules: grab the closest book to you, go to page 56, & copy the 5th sentence as your status. Don't cite the book; post these rules. An alternative is 14 Ba3, e.g., 14...Rb8 15 c5 d5 16 c6 bxc6 17 Qb4 Bf6 18 Qc5! 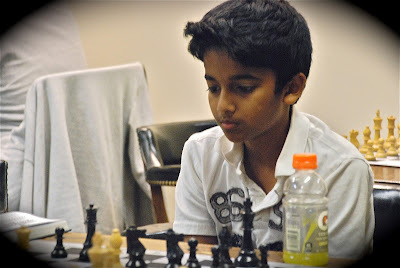 Ng7 (18...cxb5? 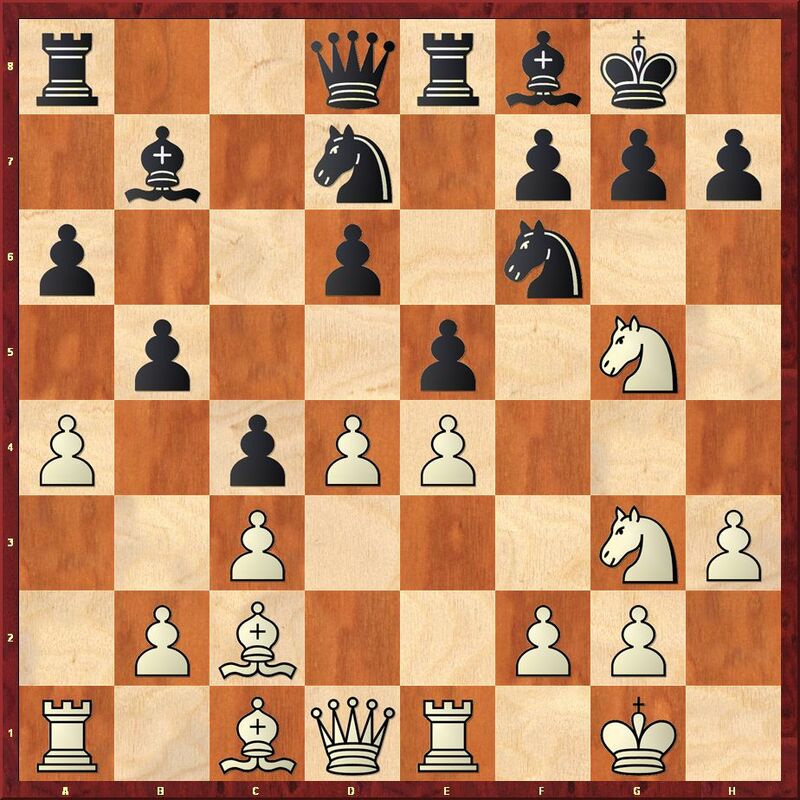 19 Nxd5) 19 bxc6 Ne6 20 Qa5 Nxc6, when Valdes claims a clear plus for White after 21 Qa4, but 21 Qxd5! is even stronger. Carlsen in the Huffington Post! auditorium)! He was amazingly gracious and patient. Kudos to the chess NYC staff which was absolutely amazing! The attendees ranged from little kids to adults, rank beginners to masters and they managed everything beautifully. 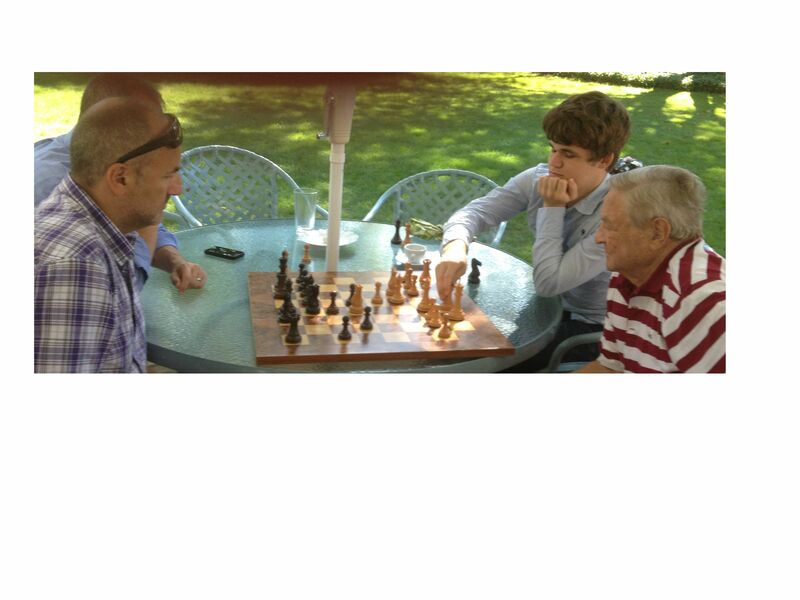 And then of course was the blitz game Ken Rogoff, the eminent economist played with Carlsen. Above is a photo I never tired of seeing. From the 1970's at the Boylston. Ken Rogoff standing and leaning is giving advice. Chris Chase with arms folded and dark hair is observing. BTW, the man standing over Chris is Dan Harrington, the poker player. 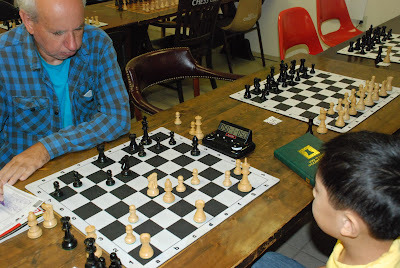 Rogoff is a GM and after 30 years of not playing chess, not even a casual blitz game, Rogoff played Carlsen to a draw. Read Kalavek's entire account below, from the Huffington Post. This account is from the Huffington Post. 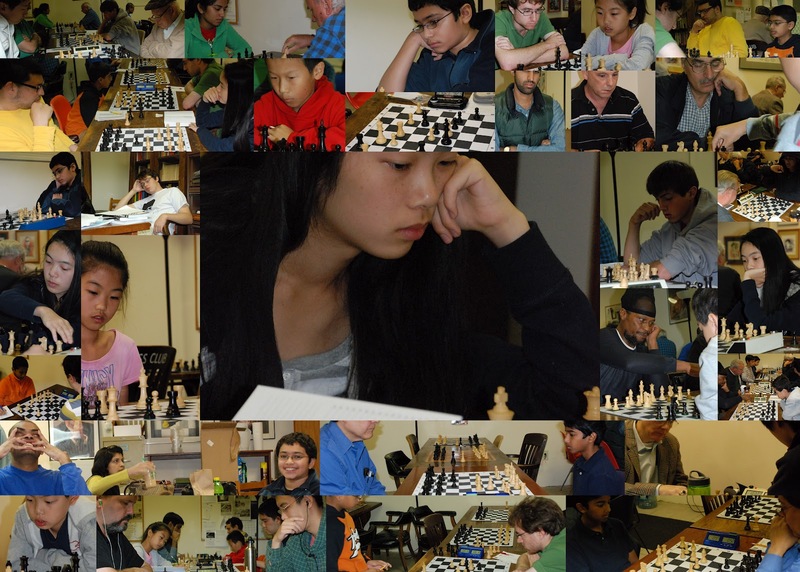 They could barely reach the other side of the chessboard, but playing against the world's top-rated grandmaster Magnus Carlsen was a thrilling experience for many New York kids. 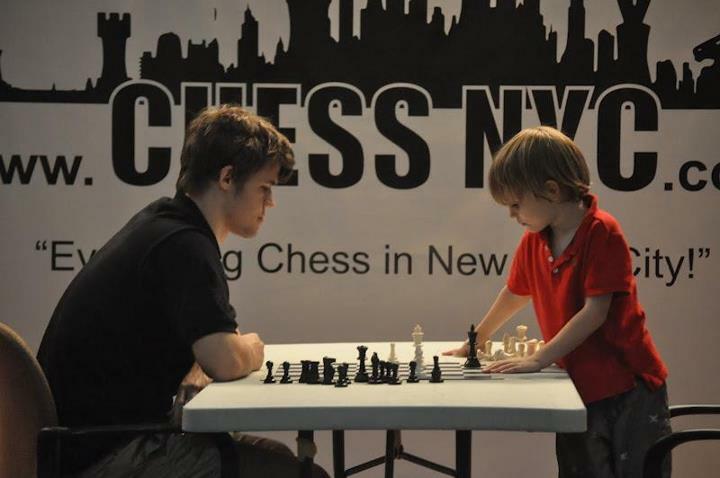 Carlsen visited New York during the last two weeks in August. 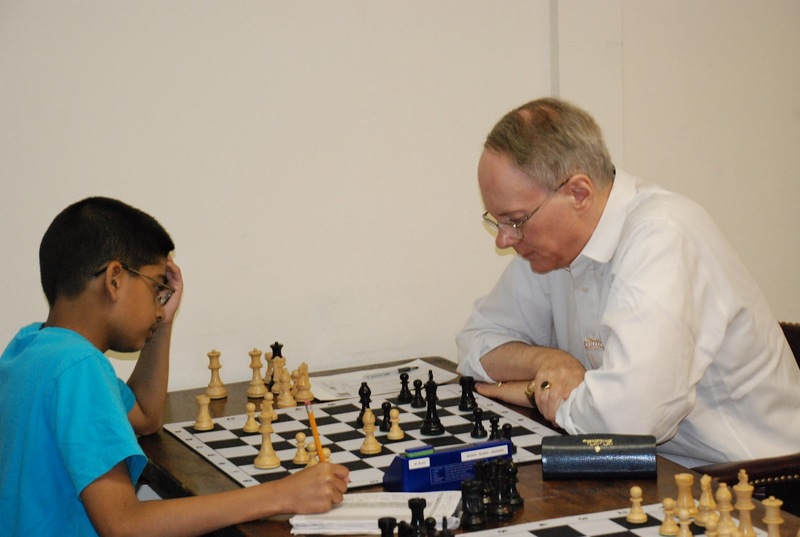 He played chess against children at the NYC Chess summer camps and against adults at the club near the Washington Square and the Marshall Chess Club. He was also engaged at the chess board with a billionaire investor and philanthropist, George Soros, and played a blitz game against one of the world's leading economists, Kenneth Rogoff. He shot baskets at pick-up games, visited the New York Yankees, and saw friends. Some people may recognize Magnus from his appearance on Colbert Report. Carlsen was teaching children for the first time. "Magnus enjoyed working with them," said his manager Espen Agdestein. " He hopes to be back next year." 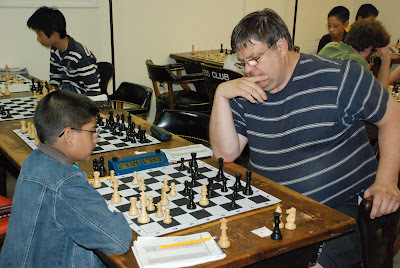 Michael Propper, the co-director of the New York City Chess programs, was ecstatic:" The week reached well beyond traditional chess introduction and promotion. It was motivational, inspirational, informational and, most importantly, tremendous fun...the impact of which will be felt for a very long time. " 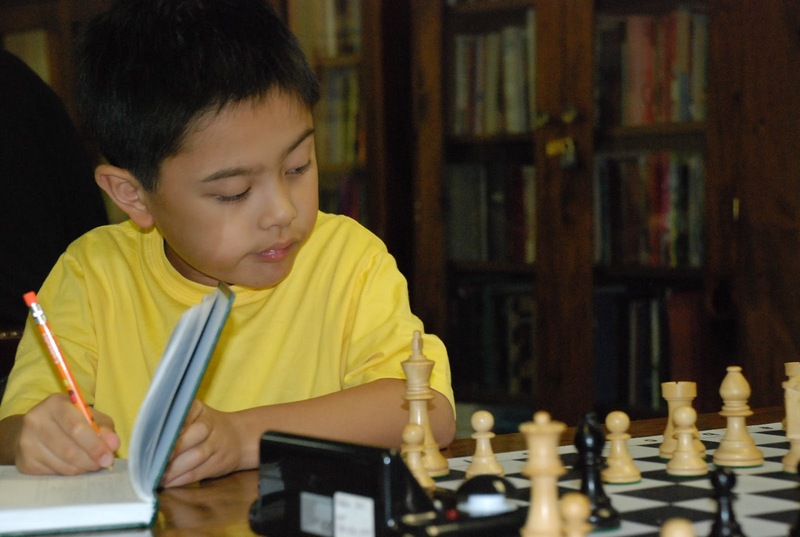 He added that Magnus can teach, cares and enjoys working with childern and his visit inspired many chess fans. George Soros is a chess lover and has played the game more or less regularly since he learned it during the war in 1944. He invited Carlsen and Agdestein to his summer house in the Hamptons. They had a four-hour lunch, with undoubtedly interesting discussions and lots of chess. Eventually, Soros and Carlsen teamed up against Agdestein and Richard Conn, a New York lawyer who helped Anatoly Karpov in his bid for FIDE presidency in 2010. The outcome of the game was never in doubt. Arctic Securites, Carlsen's main sponsor, hosted a dinner in a fine New York restaurant, Per Se, on August 28. 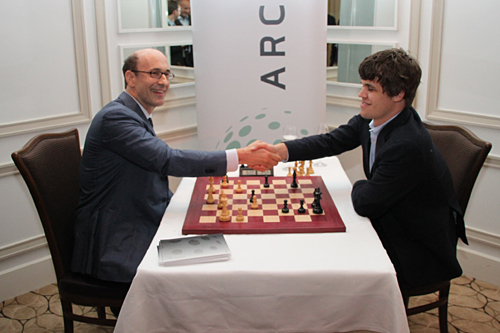 To give the evening a little chess flavor, Carlsen and Rogoff played an exhibition game. It was intended to be a five-minute blitz game but the clock was not working properly. They casually continued at a blitz-like pace anyway. Rogoff has been Carlsen's admirer for some time. " Magnus plays at level of tactical brilliance and sublime endgame technique that I could not even imagined, even from people like Petrosian, Tal and Larsen whom I played in the 1976 Interzonal in Biel." 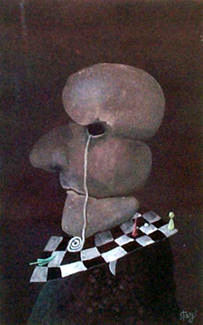 Needless to say that Ken drew the games against the three chess giants. He qualified for Biel by finishing second at the 1975 U.S. championship where I was one of his victims. Rogoff's chess talent was extraordinary. At 15, he played a blindfold simultaneous exhibition against 25 opponents in Rochester, N.Y. At 16, he was one of the top U.S. juniors and his considerable chess skills were publicly recognized by Bobby Fischer. He finished third at the 1971 World Junior Championship. In the same year he was a member of the U.S. team at the student olympiad in Mayaguez, Puerto Rico, and I was the captain. We played in U.S. championships and met on a few occasions when he lived in Washington, D.C. Rogoff became grandmaster in 1978, but after a few years left chess. He turned to economy and became one of the most respected experts. He has been Thomas D. Cabot Professor of Public Policy and Professor of Economics at Harvard University since 1999 and for a brief two year period (2001-2003) the Chief Economist and Director of Research at the IMF. His advice is being sought by financial and political leaders throughout the world. 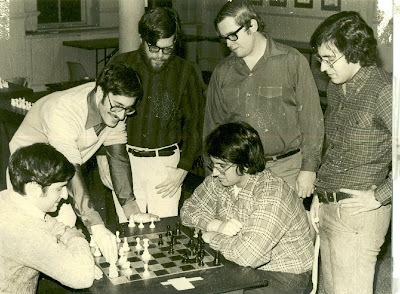 For more than 30 years, Rogoff didn't play any chess games, not even casual blitz games. 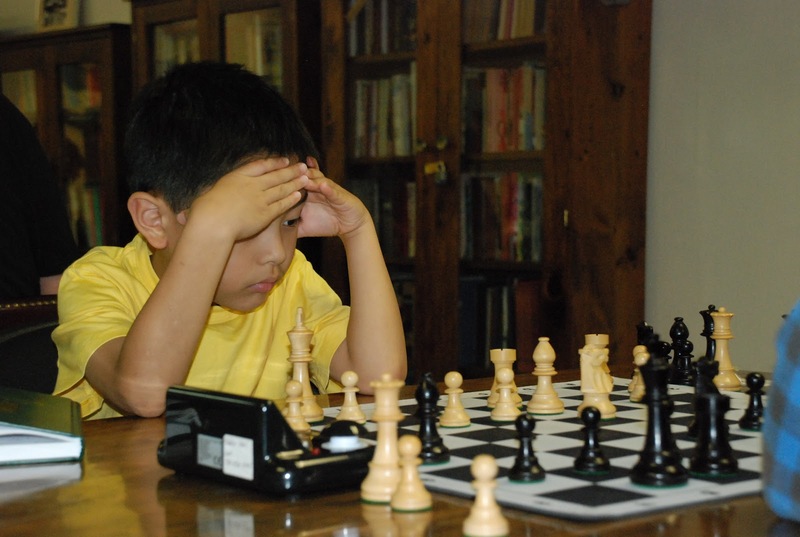 What was he thinking about going against the man who just reached his highest rating of 2843 and sits at the top of the FIDE rating list as the world's best? "I miraculously was allowed to escape with a draw," said the only chess grandmaster among prominent economists, and the best economist among chessplayers. The game tells a different story. Blitz games should not be commented, some say, but moves that come to you are often based on instinct and can reveal a player's character. Greed, courage and fear are magnified. Brilliance is encouraged, but not practical. Carlsen said that Rogoff played a good game. The notes are partly based on their post-mortem. The Breyer variation of the Spanish. 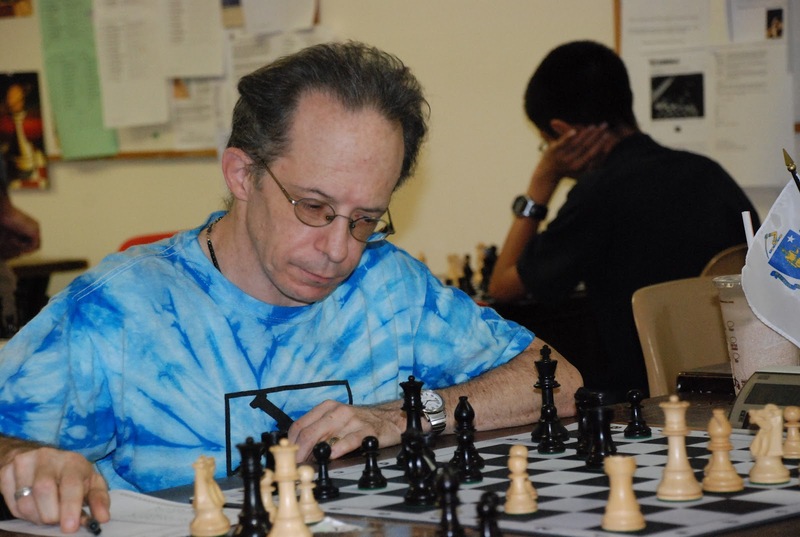 "The defense is credited to Guyla Breyer, a Hungarian master who was among the top ten players in the world in 1918 but who died in 1921 at only age 27 of heart attack," writes Larry Kaufman in his absorbing book "The Kaufman Repertoire for Black and White," published by New In Chess. "To come up with the move 9...Nb8 at the time took a real genius, as the belief in "development" was very strong since the time of Morphy." However, the world champion William Steinitz and his challenger Mikhail Chigorin chased their horses back to the stable, to the square b8, long before Breyer did, perhaps less elegantly. The immediate strike in the center was popular at the speed events in Astana in July. 11...Bb7 12.Bc2 Re8 13.Nf1 Bf8 14.Ng3 c5 is how the Breyer Main line usually unwinds. 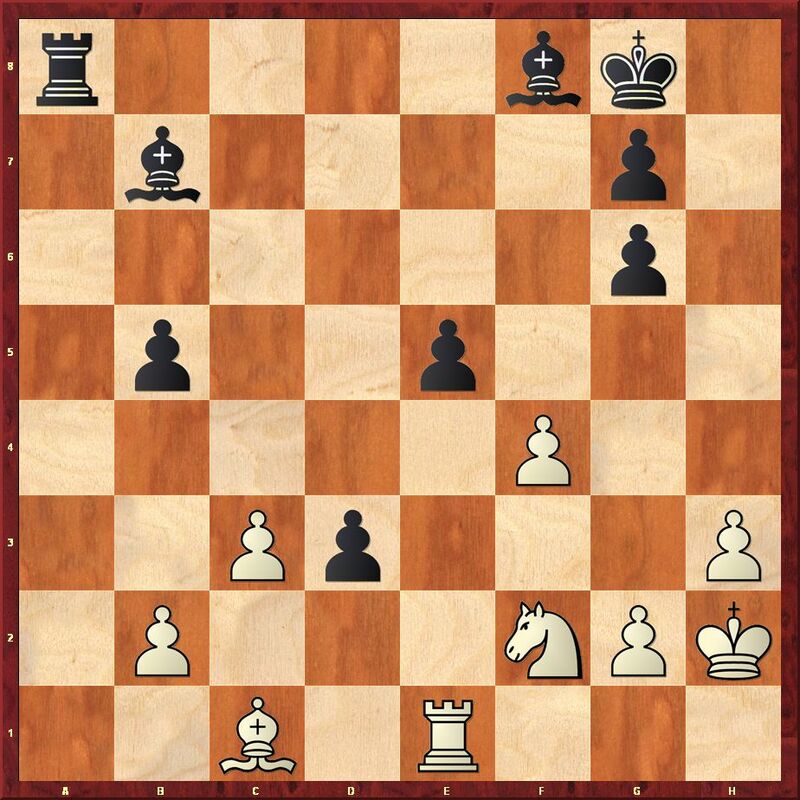 In the game Polgar-Spassky, played in Budapest 1993, black made a slip 11...Re8? 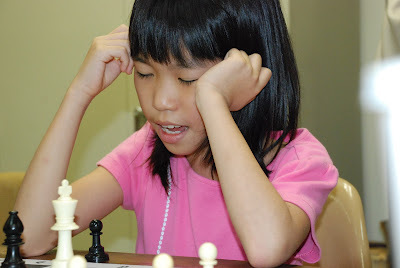 and Judit overlooked 12.Bxf7+! Kxf7 13.Ng5+ Kg8 14.Ne6 winning. Carlsen provided some clues for black's play in his game against Veselin Topalov in Astana 2012: 12.d5 c4 13.Bc2 Qc7 14.Nf1 Nc5 Compared to the Breyer Main line, black saved moves Rf8-e8 and Bc8-d7. 15.N3h2 a5 16.a3 Rb8 17.Bd2 Nfd7 18.Ng3 Qd8 19.Nf5 Nb6 20.Nxe7+ Qxe7 21.Be3 Nba4 22.Rb1 f5 23.f3 f4 24.Bf2 g5 25.Kf1 Bd7 26.Ke2 b4 27.axb4 axb4 28.Qd2 b3 29.Bd1 Nd3 30.Rg1 Bb5 31.Kf1 Ra8 32.g3 Kh8 33.gxf4 gxf4 34.Rg4 Bd7 35.Bh4 Qf7 36.Be2 Nac5 37.Kg2 h5 38.Rg5 Rg8 39.Bxd3 Nxd3 40.Kh1 Rxg5 41.Bxg5 Bxh3 42.Rg1 Rg8 43.Qe2 Kh7 44.Bh4 and Topalov resigned. After 44...Rxg1+ 45.Kxg1 Qa7+ 46.Kh1 Qa1+ and black wins. 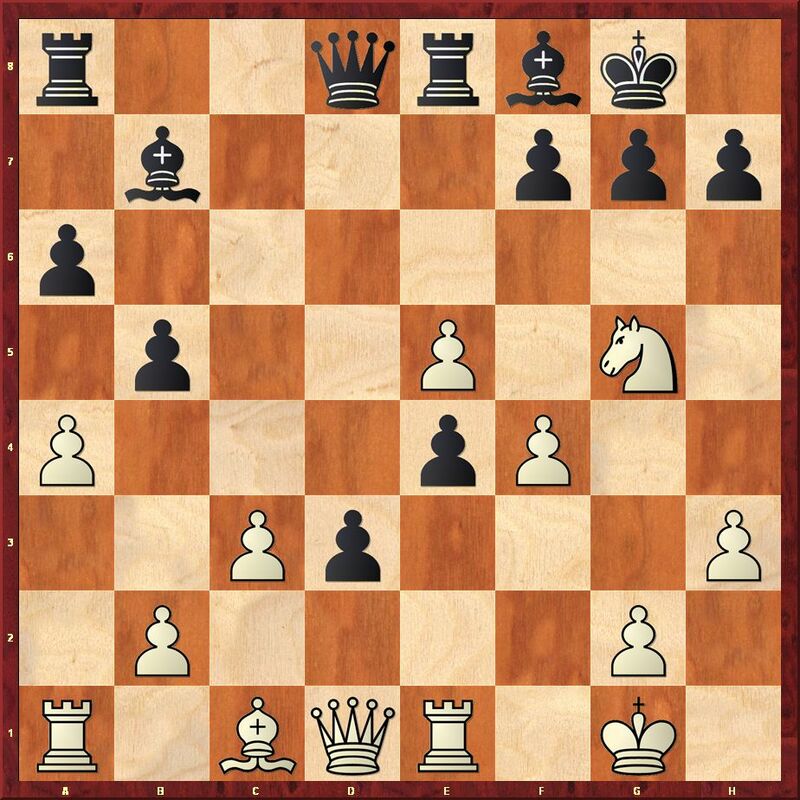 Ivanchuk as black didn't have problems to equalize against Grischuk in Astana 2012 after 14.Bc2 cxd4 15.cxd4 exd4 16.Nxd4 d5 17.exd5 Rxe1+ 18.Qxe1 Bb7 19.Ngf5 Bxd5 20.Be3 Rc8 21.Rd1 Qe8 22.Bb1 Be4 23.Bf4 Bxb1 24.Rxb1 Nc5 and the game petered out to a draw. 15.Bc2 g6 16.d5 (After 16.b3 d5 is possible.) 16...c4 would be the Bryer Main line. Carlsen goes for a violent clash in the center. "A very enterprising pawn sacrifice giving lots of compensation and perfect for crushing a much weaker player," says Rogoff. 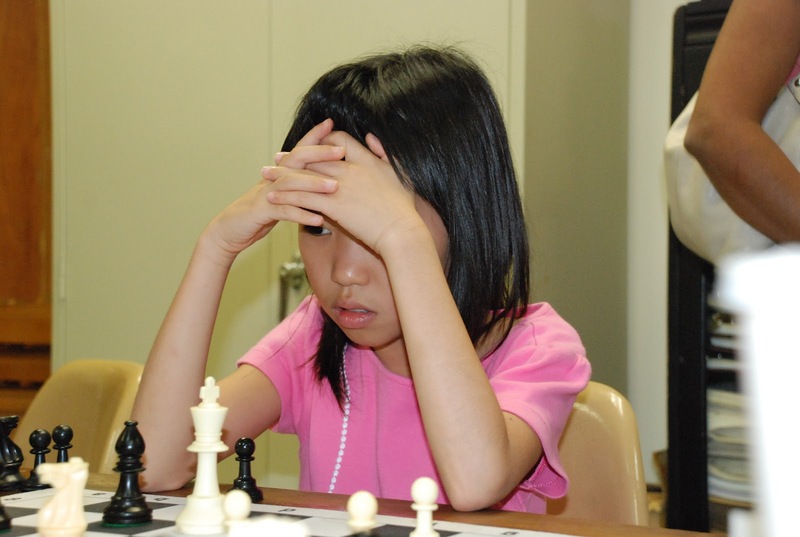 16...h6 was played previously. 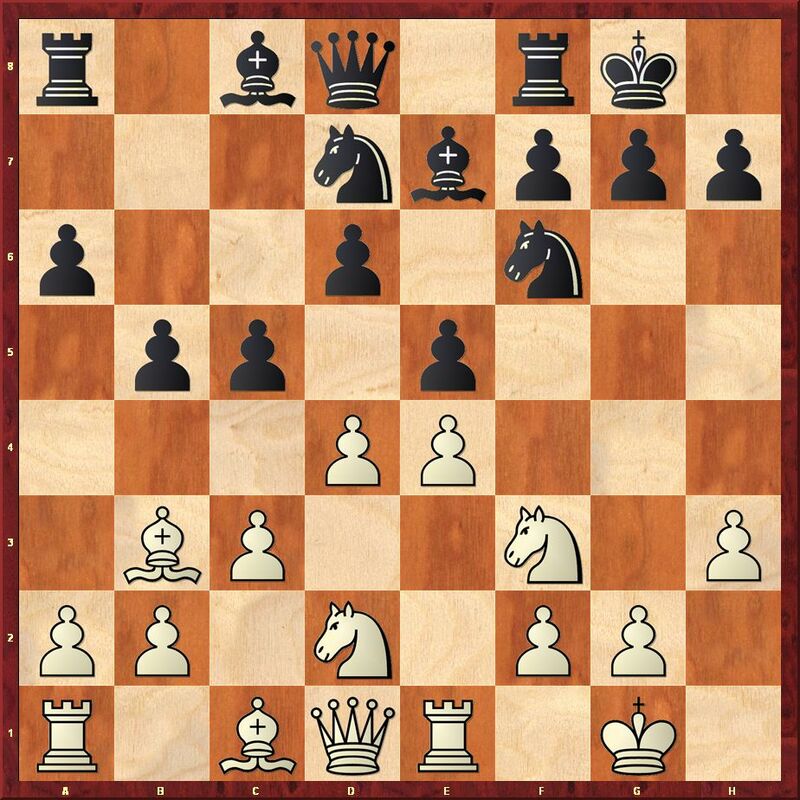 Computers suggest 16...exd4 17.Qxd4 (17.cxd4 b4) 17...Nc5 with a pleasant game for black. Computers prefer sharper and more complicated way: 20...h6 21.Nf3 (21.exf6 Qb6+ 22.Kh2 hxg5; 21.Nxf7 Kxf7 22.exf6 Rxe1+ 23.Qxe1 d4) 21...Ne4 22.Nf5 bxa4 23.Qxd3 a3 24.bxa3 Rc8 with excellent play for the pawn. After 21.Qxd3 Rogoff wasn't sure how to respond to 21...f6 (Black also has 21...Nxg5 22.fxg5 bxa4 23.Rxa4 g6 with roughly equal chances. 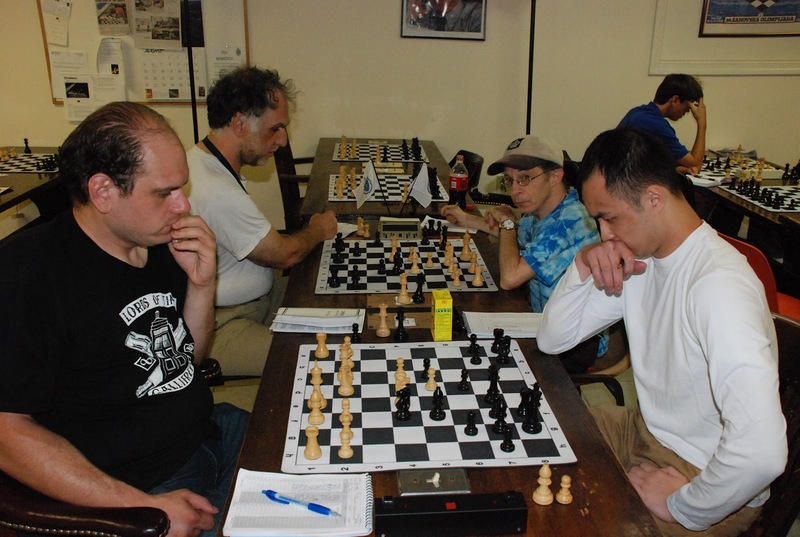 ), but 22.N5xe4 dxe4 23.Qxd8 Raxd8 24.axb5 axb5 25.exf6 gxf6 26.Be3 Rd3 27.Kf2 is in white's favor. Magnus missed this queen sortie and now has to scramble. Fortunately, there is a way out. After 23.Kf1 black can even try 23...h6 (23...Qg6 24.Qxg6 hxg6 25.Nxe4 f6 26.axb5 axb5 27.Rxa8 Bxa8 28.Nf2 Bd5 29.Bd2) 24.Qxf7+ Kh8 25.Nxe4 Rad8=. 23...Qg6 24.Qxg6 hxg6 25.Nxe4 f6?! Carlsen suggested 29.fxe5! ?, for example 29...b4 30.c4 b3 31.Nxd3 Ba6 32.Nf4 and white is better. 32.Bc1 Ra1 33.Bd2 Ra2 draw agreed. Friendly analysis after the game. Emanuel Mevs (Harvard Law School 3 yr student) clear 1st in open section with perfect 4-0. Oliver Traldi, clear second in open section: 3 out of 4. David Martin, clear 2nd, with 3 points. I'm hoping to generate lots of interest in BCC Saturday tournaments and the GP in particulars! Prizes: Trophies for 1st & 2nd in each age group. Medals for 3rd & 4th in each age group. And, the very popular chess pencils to all! 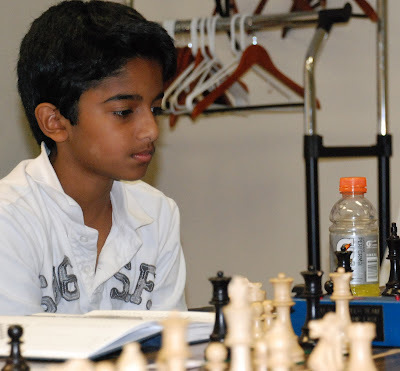 Grand Prix: Points in Grand Prix tournaments will accumulate towards winning prizes in each age group. 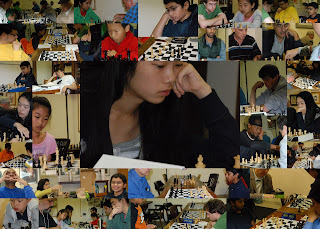 It's always nice to be able to welcome a new chess club to the ranks. I had the chance to visit the newly organized Quincy Chess Club last Wednesday evening. The Roche Brother's Grocery Store Community Room in Quincy was like most of the community rooms I'd been in in greater Boston, if somewhat larger and a bit better decorated with scholastic portraits taken in local colleges. But that wasn't the thing that what I first noticed when walking into the room last Wednesday evening. The first thing I noticed was Dan Racine, the new Quincy Chess Club's founder, greeting people at the door, answering questions and watching everything connected with this new project. 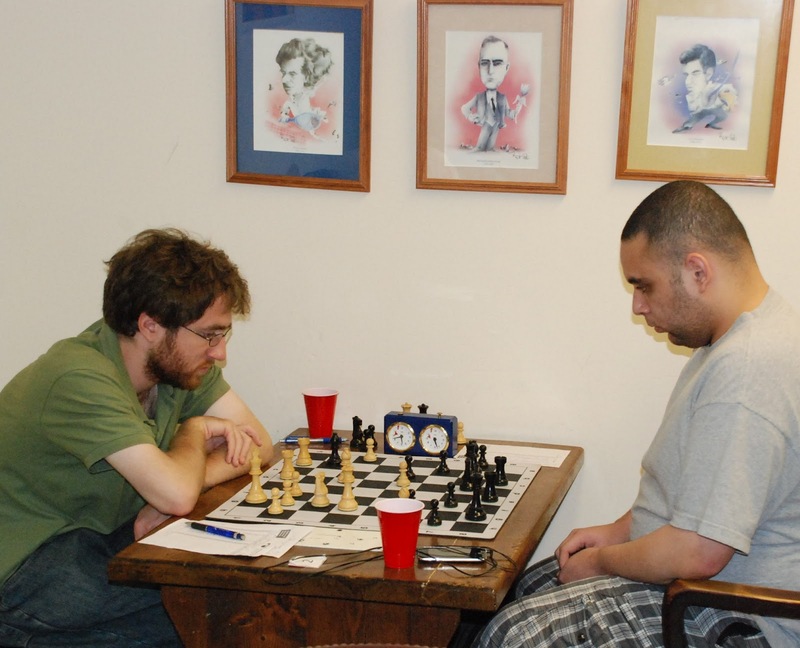 The Quincy Chess Club existed sometime in the past, but, like many clubs, it seemed to succumb both to cultural changes and perhaps a bit of the letdown chess suffered when Fisher vanished. None of that mattered to Racine. Moving to Quincy he saw the need for a chess club, and he just did it. "We're creating our own history," he told me Wednesday night. As we talked Wednesday night, Dan constantly multi-tasked. 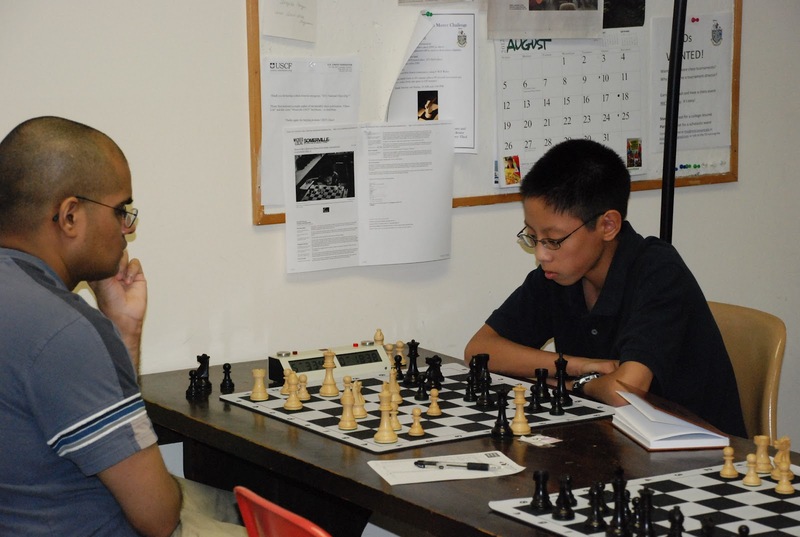 He made pairings for the Quincy Chess Club's first Quad tournament (unrated at this time), took down results, played one of the youngest club members, Josh, in a game, and then arranged for a lesson on how to do game recording for him from another club member. With the club currently having one big room it has to be admitted that games were not held in the you-can-hear-a-pin-drop environment that seems to have become the norm in tournament environments today, but Racine successfully made an effort to keep things at a reasonable level. Racine has gathered a good bit of community support for the club. The Roche Brothers are giving the club the Community Room free once a week. Many club members are business owners in the community that can be drawn upon for support and perhaps other playing sites as the club expands. I was impressed with both the solidity that the club has established now, as well as the solid plans for expansion and publicity that are in the works. 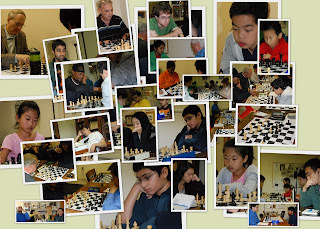 It has always been my opinion that chess clubs are the backbone of organized chess in this country. Dan Racine and the developing new Quincy Chess Club are making a major play to help anchor chess on the South Shore. 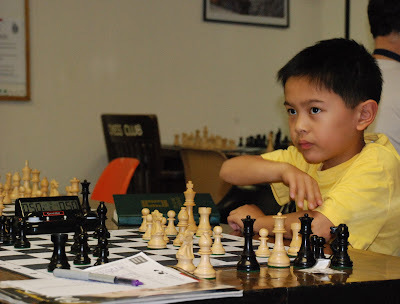 The Quincy Chess Club meets Wednesday nights starting at 6:30PM in the Community Room of the Roche Brothers Grocery Store Community Center, 101 Falls Blvd. More details can be found on their website at www.quincychessclub.com. They're worth a look. 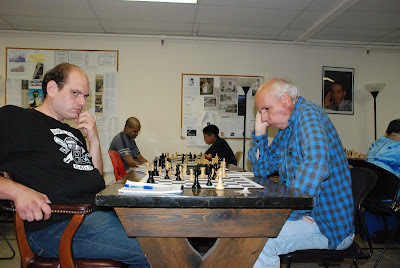 The Boylston Chess Club 2012 Championship, and its related Hauptturnier Tournament, started off in fine form on Monday evening at 7.00PM when several Boylston Chess Club members sat down to battle it out over the board. The Club Championship will be a 7-round Round Robin tournament. Struggling for title of King of the Heap are, in no particular order, IM Jonathan Yedidia, FM Chris Chase, NM Carey Theil, IM Charles Riorden, NM Lawyer Times, NM Chris Williams, and NM Libardo Rueda. People playing in the Hauptturnier Tournament this year include Terrance Fricker, Seth Lieberman, Robert Holmgren, Jonathan Lee, Ted Cross, Bernardo Iglesias, and Khimet Sadykov. Chief Tournament Director for the two events is Robert Oresick. Our Treasurer was unfortunately ill as the tournaments began so Bernardo Iglesias stepped in for him for the time being. We await a good word regarding Bob's health with anticipation. After several hours of hard fought battles, the following results were garnered. Jonathan Lee - Ted Cross Postponed. Meanwhile, we have additional photos from the First Round! The Second Round for both tournaments continues next Monday night, the 17th. the BCF Hauptturnier begins on Monday, September 10. If more than 10 players register, the lower rated players will play in a Swiss or Round Robin. Alex Cherniack and Bill Kelleher suggested the corresponding tournament would be for, ... what's the German word?... for patzers. So, if there is sufficient interest, we will sponsor the 2nd annual Patzerturnier. Last year we had 10 in the Hauptturnier and broke it into 2 closely matched groups.